As Black Friday approaches, you’re starting to think about crowd control equipment. Do you have it? Do you need it? Do you need to get more, or replace some of the equipment? A lot of our clients call to inquire about renting equipment. They see traffic increase exponentially at this time of year, so they need new stuff or simply more of it for their busy season. Some of them only need it for the holidays, so it seems sensible to rent, and it is sensible, but only in the short term, for one single use. However, if you’re going to need it again in the future, even if just for the holidays, then you need to consider the pros and cons of both renting and buying. To help you out, we’ve broken them down. It’s cheaper – in the short term. You don’t need to store the equipment. There’s no need to clean the equipment. It’s more expensive – in the long term. You can’t use your equipment to advertise. You can not count on getting exactly what you want, how you want it, or when you want it. It’s cheaper – in the long run. You can use the equipment after Black Friday – for spring sales, summer promotions, and any other busy times throughout the year. You can use your posts, ropes, and belts as advertisements and message carriers. You’ll get exactly what you ordered, when you need it, in the quantity you requested. You need to store the equipment. You may need to clean it. All of these pros and cons are somewhat self-explanatory, but let’s break a few down. Price. It’s simple math. Renting is cheaper than buying. But that’s only if you’re renting once. If you plan to rent every year, those costs will build, and you’ll end up spending way more money than you would with a purchase. With regards to storage, it can certainly be a pain. 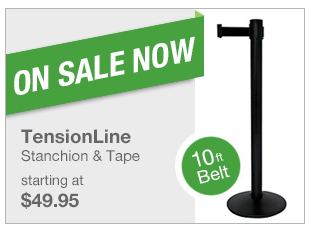 You’re thinking, I don’t have room for all those stanchions. We understand. But before you rule it out, give us a call and ask about all of our storage and transport options. We’re usually able to find a solution for clients concerned with storage space. If you have questions on this matter or any other, please feel free to give us a call. Our crowd engineers will walk you through any questions or concerns you may have. 1.888.404.7892.